ALTADENA — A body found set ablaze on an Altadena sidewalk a week ago is no longer listed a John Doe, however investigators withheld the man’s name until his family could be notified, coroner’s officials said Sunday. The body found burning in the 2600 block of Windsor Avenue April 15 is that of a 70-year-old black man, Los Angeles County Department of Coroner Lt. Joe Bale said. His city of residency was not known. Though the man had been identified, his name was not released pending confirmation that his next-of-kin had been notified of his death, Bale said. A passing motorist first found the body of the man, bound and the hands and feet and set on fire, according to Los Angeles County sheriff’s and coroner’s officials. An autopsy has been carried out, but the man’s cause of death remained under investigation pending the results of further tests, Bale said. No information regarding a possible motive or suspect in the killing has been released. WEST COVINA — A man robbed a hamburger restaurant employee Saturday as she was transporting money from a bank to the business, police said. The woman, an employee of Five Guys Burgers and Fries, 1455 Plaza Drive in the Westfield West Covina shopping mall, had just withdrawn money from a bank and was exiting her car in front of the restaurant when a robber pushed her to the floor, West Covina police Lt. Tommy Garcia said. The man snatched the deposit bag, which contained a significant amount of cash, and jumped into a red, square-shaped SUV with a woman at the wheel, he said. Police described the robber as a black man, 18 to 20 years old, about 6 feet tall and 200 pounds. He wore a gray hooded sweat shirt. The driver of the getaway car was described as a black woman between 20 and 30 years old, wearing a red bandanna on her head. SANTA FE SPRINGS — Three armed and masked robbers targeted iPads and cell phones Saturday during a takeover robbery at a Verizon store, police said. Two men and a woman, all wearing hoods and masks, entered the store in the 11700 block of Telegraph Road, just west of Pioneer Boulevard, about 4:30 p.m., Whittier police Lt. Carlos Solorza said. One of the men and one of the women carried handguns. “They ordered six employees to the ground at gunpoint,” the lieutenant said. The robbers then went into a back room of the store and stole an unknown number of iPads and Android cell phones, he said. “They fled out the back door and left in black Dodge Magnum,” Solorza added. None of the employees were injured during the robbery. Anyone with information was asked to call Whittier police at 562-567-9200. GLENDORA — Rescuers hospitalized four people, including one who was flown to a trauma center by helicopter, following a head-on crash on Foothill Boulevard early Saturday, authorities said. The crash occurred about 9:10 a.m. in the intersection of Foothill Boulevard and Barranca Avenue, Glendora police Lt. Rob Lamborghini said. One car contained four young women and was making a left turn from Foothill onto Barranca, police said. The other car, which contained only a driver, was heading in the opposite direction on Foothill. The cause of the crash remained under investigation, but the cars met in a “near-head-on collision” in the intersection, Lamborghini said. Three young women from the first car and the woman who was driving the second car were hospitalized with injuries which appeared to range from minor to moderate, the lieutenant said. 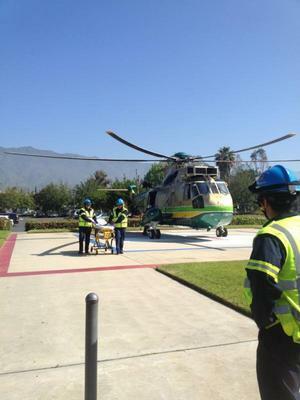 One of the young woman was flown to a trauma center at Los Angeles County-USC as a precaution, though her injuries were not initially believed to be life threatening. A third vehicle was subsequently struck by one of the first two cars, but the driver of that vehicle was not hurt, police said. A Baldwin Park man who in 2008 severely beat his wife and then left her and her unborn child to die slowly over a period of several hours was sentenced Friday to life in prison without parole. Carlos Luis, 39, was convicted by a jury in March of first-degree murder for the death of his wife, Bertha Luis, and second-degree murder for the death of the 25-week-old fetus she was carrying. For the first-degree murder, Luis received a sentence of life in prison without parole. For the second-degree murder, he was sentenced to 25 years to life in prison. Bertha Luis, then 35, died hours after she was found slumped on the bathroom floor of the Baldwin Park home she shared with Carlos Luis and their two children, said Deborah Scott, the prosecutor on the case. Carlos Luis declared that Bertha Luis, who “was really out of it,” was drunk and told his children to leave her on the bathroom floor, Scott said. When he checked on her later that day, she was dead. Carlos Luis told police his wife injured herself in a fall, Scott said. But a coroner’s investigation found numerous internal injuries, including several broken ribs, lacerations to her liver, and bruising on her pancreas and colon. She may have also been suffering from a concussion. The Los Angeles County coroner’s office determined her cause of death to be “abdominal blunt-force trauma inflicted by another person,” as well as bleeding in her uterus, said Los Angeles County Coroner Deputy Chief Ed Winter. Some of the broken ribs had already begun healing, Scott said, leading investigators to believe that Bertha Luis had been subjected to ongoing domestic violence. In addition, she had bruising on her arms, indicating she had tried to shield her abdomen, and unborn child, from the blows. “Later on we learned he did make statements that he had in fact hit her in the past, kicked her in the past, slapped her in the past,” Scott said. Scott said statements by the couple’s children led investigators to believe Bertha Luis was beaten sometime during the weekend, and left to suffer until she died Monday, Sept. 1, 2008. Family members of Bertha Luis told investigators that Carlos Luis had been assaulting her from almost the time they met in 1989, when she was only 15. “He was her first boyfriend and things went downhill from there,” Scott said. When Carlos Luis found out his wife was pregnant, he began urging her to get an abortion, despite her desire to keep the baby, Scott said. The couple’s son is now an adult and lives on his own, Scott said. Their daughter is in the custody of Carlos Luis’ mother. Both Bertha Luis’ mother and sister appeared in court Friday, Scott said. Luis will return to court next month for a restitution hearing to determine how much he should pay to Bertha Luis’ family for her burial costs. PASADENA — A Glendora man whose conviction for a 1984 murder was recently overturned was released from custody Saturday for the first time in 27 years on bail, records show. Frank O’Connell, 54, was released from prison at 8:27 a.m., after family members posted a $75,000 bond set by a Pasadena Superior Court judge Friday, according to county booking records. O’Connell’s 1985 conviction for the Jan. 5, 1984 shooting death of 27-year-old Jay French of South Pasadena was overturned last month by Judge Suzette Clover, citing recent witness recantations and improprieties in his original murder trial. At a hearing Friday, the Los Angeles County District Attorney’s Office announced plans to pursue a second trial for O’Connell, and a hearing date was set for May 18. Meanwhile, Clover ordered that O’Connell’s bail be set at $75,000 — the same amount that was originally set by Judge Sally Disco in 1984. Family members of O’Connell were elated by the news, and quickly posted the bond. O’Connell has consistently maintained that he did not commit the South Pasadena slaying and has convinced others of his innocence as well, including family members, fellow inmates, prison officials and the nonprofit foundation Centurion Ministries, which works to free wrongly convicted inmates and took up O’Connell’s case in 1998. Family members of Jay French, however, said they still believe in O’Connell’s guilt, and were disappointed by the $75,000 bail amount O’Connell was released on. SAN MARINO — Two armed men wearing masks and sunglasses got away with a large amount of cash after a takeover robbery of a local bank Friday. Police didn’t reveal the exact amount taken from the East West Bank at 805 Huntington Drive. San Marino police Sgt. Jay Wilburn said no one was injured in the heist, which took place just after 10 a.m.
“Both suspects were each brandishing an unknown type of handgun; one described as a black handgun and the second described as a silver and black handgun,” said San Marino police Detective Henry Todd. While in the vault, the robbers helped themselves to a large amount of cash, which they placed into a large “military-style” bag, Todd said. The gunmen only appeared to be interested in the money from the bank’s vault, police added. “The suspects did not remove any currency from the individual bank teller stations,” Todd said. Wilburn said the men fled from the bank in a burgundy Ford Mustang, which officers later found abandoned about a block away from the bank. “It was stolen April 19 in Inglewood,” Wilburn said. Police described one of the suspects as a black man, 5 feet 2 inches to 5 feet 5 inches tall and between 140 to 170 pounds. He was wearing a black T-shirt, a hooded sweat shirt with the hood pulled over his head, a black knit cap, a pair of sunglasses, gloves and a mask that covered the lower portion of his face. The other suspect was described as a black man, between 5 feet 8 inches to 5 feet 10 inches tall and weighing 160 to 180 pounds. He had a thin mustache and wore a black nylon jacket with security badges or patches on the sleeves and chest, a black knit cap, gold-framed sunglasses and gloves. Like his companion, police said this suspect also had a mask covering the lower portion of his face. The FBI is assisting San Marino police in the investigation. Anyone with information was asked to contact San Marino Police at 626-300-0720. BALDWIN PARK – A 26-year-old unlicensed driver sustained minor injuries when his sport utility vehicle struck one vehicle, hit a parked car then rolled over. At one point, the black Chevrolet Blazer was seen heading the wrong way on a street. Police suspect speeding and drinking contributed to the crash. Baldwin Park police Sgt. Chris Kuberry said the Chevrolet Blazer ended up on its side and lying near it was an empty champagne bottle. It began at 11:06 p.m. with a call to police about a vehicle driving the wrong way on Frazier Street. Kuberry said within minutes, the Blazer clipped a car at Frazier Street and Francisquito Avenue. The occupants of the car weren’t injured, he added. The SUV continued northbound on Harland Avenue. It crashed into a parked car on Harlan Avenue and Morgan Street then rolled over, according to Kuberry. He said the Baldwin Park man driving the Blazer sustained cuts, abrasions and complained of pain. The man was taken to a local hospital. WHITTIER — A man who tried to sell marijuana valued at $500 to a medical marijuana dispensary was later assaulted and robbed of his wares by two men Friday night. Whittier police Lt. Steve Dean said the 10:02 p.m. attack in the 13300 block of Slauson Avenue left the 26-year-old Los Angeles man with a cut above the eye and a broken finger. Dean said the man earlier went to a Santa Fe Springs dispensary to sell marijuana he grew but was turned down. Later, he was on Slauson Avenue in Whittier when two men accosted him and demanded the marijuana which was in a backpack. “It sounds like they fought over the bag,” Dean said. One of the robbers pulled a knife, he added. “They took the marijuana, cut him over (the eye), broke his finger in several places,” Dean said. The injured man was taken to a local hospital. PASADENA – A Glendora man who had his conviction for the 1984 murder of a South Pasadena man overturned last month was expected to be freed following an emotional hearing Friday in Pasadena Superior Court. Throughout his 27 years behind bars, Frank O’Connell, 54, has maintained that he did not shoot and kill 27-year-old Jay French in South Pasadena on Jan. 5, 1984. Finding major problems with O’Connell’s murder trial, Pasadena Superior Court Judge Suzette Clover threw out the conviction March 29. Clover cited several issues that she said denied him a fair trial. Key eye witnesses in the case have recanted their testimony and Clover found that potentially important information, including hand-written notes by detectives containing potentially exculpatory information, had not been turned over to the defense. But O’Connell’s release was not arranged until Friday’s followup hearing. Deputy District Attorney Scott Goodwin announced plans at the hearing to re-try the murder case, and a pre-trial hearing was set for May 18 in Pasadena Superior Court. Still, O’Connell was expected to be freed within hours, or by early next week at the latest, after Judge Suzette Clover set his bail at $75,000 – the same amount initially set by the presiding judge in the first murder trial. Murder suspects arrested today are generally held in lieu of $1 million bail.